Brexit benefits Moscow. 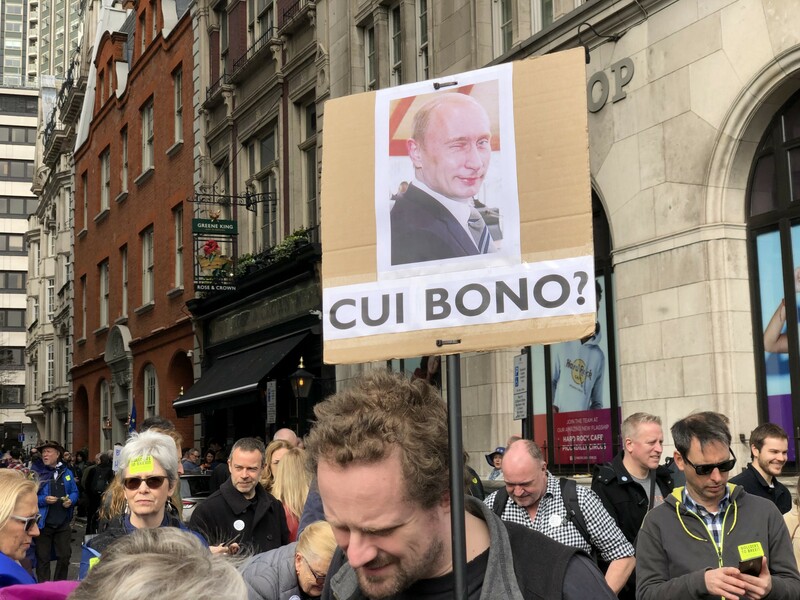 People’s Vote March, London. Shell-shocked by the Trump victory, European leaders have been captivated by the Mueller investigation into claims of Russian collusion. But it should be no surprise that the report fell short of expectations. The Mueller report was supposed to confirm every suspicion that the Trump campaign was in league with Russian agents. Yet it has not recommended any new indictments. It appears that the special investigation found no conclusive proof of Russian collusion or obstruction of justice. In the weeks since, President Trump has been quite happy to claim ‘exoneration’, even though the full report has yet to be released. There are still plenty of liberals hoping that the report’s 400 pages will contain damning truths about the 2016 election and the links between the Trump campaign team and the Russian elite. Meanwhile, Europeans stand by and watch as the saga unfolds. Italians fear there was a Russian hand behind the Lega’s rise to power and the French establishment worries about the extent of Russian support for Marine Le Pen. This is one way to stoke division over the future of the EU. It’s clear that the Putin government has something in common with national populists. Indeed, the European far-right has long admired Vladimir Putin as a great strong man who has saved Russia from so-called ‘globalists’ — and this is increasingly true of the American far-right as well. After the fall of the Berlin Wall, the Soviet Union was clearly living on borrowed time and it was possible to be optimistic about the new order coming into being. It looked like the end of the Cold War would guarantee a safer world. The USSR achieved unprecedented reforms under Mikhail Gorbachev and the US appeared to be open to serious talks on missiles and NATO expansion. The Soviet leader would have been happy to oversee a social democratic transition to a mixed economy. But he was outmanoeuvred. Hardliners launched a coup to oust Gorbachev and turn back the clock. The putsch failed, however, it succeeded in shattering what remained of the Soviet leader’s authority and made Russian President Boris Yeltsin a hero. He would soon make his own move against Gorbachev and dissolve the USSR. Instead of a gentle transition to a Scandinavian-style economy, Yeltsin embarked on a radical agenda of tearing up price controls, cutting public spending and slashing regulations. He rapidly privatised more than 200,000 state-run companies and devalued the rouble. Masses of people lost their jobs and fell into poverty, while those who kept their jobs had little guarantee of getting paid on time or at all. A new elite began to emerge, absorbing the fallout and picking up the state assets being auctioned off by voucher. The end result was that by 2000, 74 million people were in poverty, with 37 million of them ranked as ‘desperate’. While Moscow became home to packs of stray dogs and more billionaires than any other city in the world. Such social conditions are hardly favourable to liberal democracy. Yeltsin resigned having lined up Putin as his successor, ostensibly to protect himself from prosecution. The far-right narrative is that Putin saved Russia from the death-spiral of the Yeltsin years and restored the dignity of the country. Yet there was far more continuity than change in real life. Once in power, Putin oversaw the consolidation of the market economy that Yeltsin had unleashed. He brought back the Soviet national anthem, but he also privatised land and imposed a flat tax regime. Much later Putin would reinvent himself as an Orthodox Christian nationalist — the man loved by the Western far-right. All of this could have been avoided. If Gorbachev had been more effective, Russia might not have endured such a brutal economic transition. The results might have been a country where the people don’t associate democracy with betrayal and humiliation. Today, the Yeltsin era is forgotten. Most people think of a shirtless, ageing strong man when Russia comes up on the news. Since the Ukraine crisis of 2014, Putin has become a quasi-demonic figure and even more so since 2016. Russia has been blamed for everything from Trump’s shock victory to the rise of Jeremy Corbyn. Since the discovery of the St Petersburg troll factory, Russian bots are apparently everywhere. Of course, the Russian government has always been able to extend its reach to certain countries. However, this was typically limited to countries on its periphery or those ‘outside’ the West’s immediate political orbit, in say, Chechnya, or Syria. Moscow’s influence inside the Beltway just isn’t as strong. That’s why it was always unlikely that the Mueller investigation would reveal Russia had played a decisive role in the 2016 election. The fact that Hillary Clinton won the popular vote — and that it was the Electoral College that tipped the balance — suggests the Russians weren’t very effective if they were trying to secure a clean win for Trump. Now the Democrats are in a tough position with no clear agenda to mobilise around. The Democrats put all their bets on Russiagate taking out the Trump presidency. The idea that the election was stolen was more appealing than the possibility that the Clinton campaign lost to one of the worst candidates imaginable. It’s much more comforting to think it was all the work of a foreign enemy. The question for Europeans is how to best understand Russia and its interests. There is the danger of overstating the country’s role in the world. And there’s also the risk of downplaying the global influence of the biggest country in the world, particularly in the European Union. The Mueller report will likely amount to nothing when it is finally released to Congress. For Trump’s critics, it will be a whitewash, led by a Republican official who had to exonerate his boss, at all costs. But the lessons are there for all to see. The United States and the EU have to find a Russia policy that isn’t based on fear or fantasy politics or scapegoating inherited from American anti-Communism. The association agreement with Ukraine, the enlargement of NATO, and the EU’s planned admission of Serbia, Montenegro, North Macedonia and ‘near abroad’ states such as Moldova, have all provoked a response from Moscow. Its time we learned to contextualise problems with Russia more and frame, more clearly, in public, why relations with our eastern neighbour are so fraught. It might make it easier to explain the reasons for the tensions and develop a foreign policy that allows for managing them more effectively. Josh White is an associate editor of Souciant. His work has appeared in the New Statesman, Novara Media and Counterpunch. Photograph courtesy of Michael Shade. Published under a Creative Commons license. NEWS MATTERS IN CRITICAL TIMES — Whether it is migration, climate change, populism or globalisation, The Battleground will look behind the news headlines, provide context, perspective and clarity where there is confusion and conflict. Ultimately it is about defending democracy.